The first and second overnight for those sleeping is planned to be in Lumberton. The hotels at I-95 exit 22-Fayetteville Rd were not flooded, but many have construction crews so make you reservation now. The Super 8 phone (910) 671-4444 has rooms available currently. For those that are doing the 600k or 1000k a small individual drop bag may be used and can be taken to the one of the hotels in Lumberton near the course and will be left at the front desk. The drop bags will be taken to the official overnight hotel for you and picked up to bring back to the finish sometime Sunday for 600k or Monday for those on 1000k. This is an ACP Brevet. The total time allowed from start to finish is 13.5 hours for the 200k and 20 hours for the 300k and 27 hours for the 400k. and 40 hours for the 600k and 75 hours for the 1000k. Riders must follow and complete the approved route. 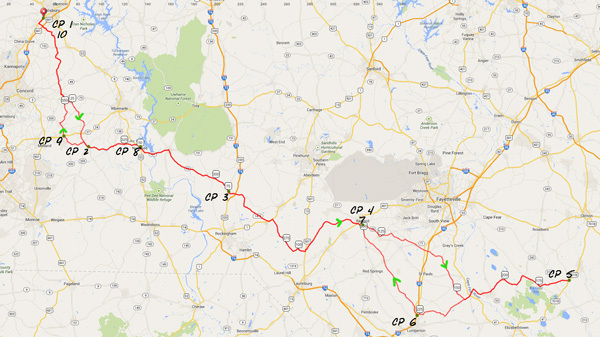 This route goes through several small towns in central North Carolina traveling along mostly low traffic roads. There may be some sections where traffic is high, so please ride carefully and safely at all times. The intermediate controls are where stores allow you to refuel with some basic supplies. There are also some other stores along the route where you may be able to stop and get limited nutritional supplies. 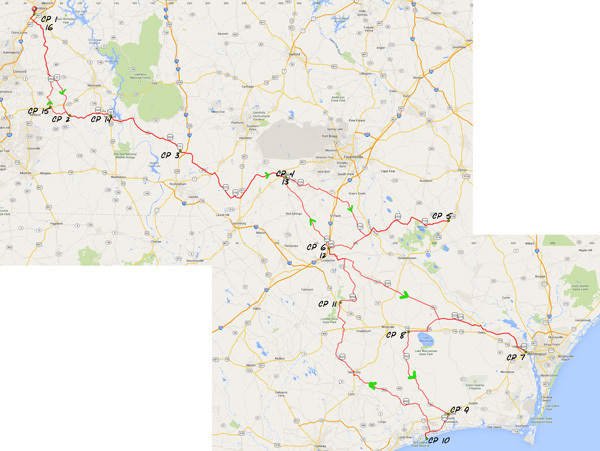 These are basic route maps. Please note that all online images, cue sheets and maps are for general reference. Offical routes will be provided at the event start for registered participants. Another map version may be available by clicking on either map. This map below is the basic route. Please note that all online images, cue sheets and maps are for general reference. Offical routes will be provided at the event start for registered participants. Anoter map version is available by clicking on either map.